On Wednesday 7 September Cloudy Principal Investigator, Professor Will Dixon, released the findings of a preliminary analysis of Cloudy data collected between February and June of this year. These early results suggest that there may indeed be a connection between the weather and chronic pain, with indications that hours of sunshine and rainfall may both play a role in pain severity. The findings sparked several days of incredible media activity for the project with interest from television, radio and the press. Will and Cloudy participant Karen Staniland were invited to talk to Naga Munchetty and Charlie Stayt on the BBC Breakfast sofa, followed by an interview with BBC World Service. Will later made a lunchtime appearance on ITV News and in the evening he was on BBC North West Tonight. Radio interviews were given by Will and fellow Cloudy researchers John McBeth and Jamie Sergeant to BBC Radio 4, BBC Manchester, BBC Kent, BBC Birmingham, and 5live. In addition to the television and radio coverage the project made headlines and was featured in almost all of the national newspapers. Some great stories were written in The Guardian, The Independent, The Times, BBC News, The Daily Mail, The Telegraph, The Financial Times, and The Mirror, as well as others. We have also fielded media enquiries from the US and Europe, showing that interest in this subject extends far beyond the shores of the UK. What has been most encouraging about all of the media attention in the last week has been confirmation that this is an area of research that is of real significance to a lot of people. 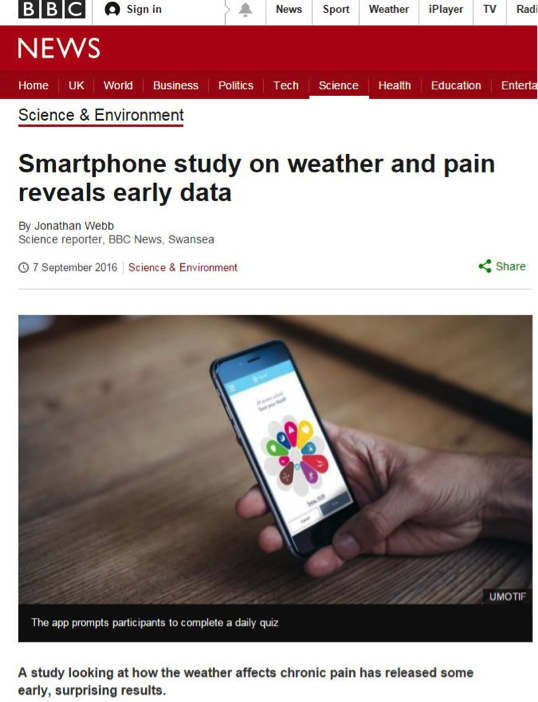 Since Wednesday more than 2500 participants have signed up to the study, all of who want to help us discover whether a relationship between weather and pain is more than just a myth. We are confident that with their support we can finally get to the bottom of this 2000 year old mystery, and look forward to sharing the findings of our full analysis next year.